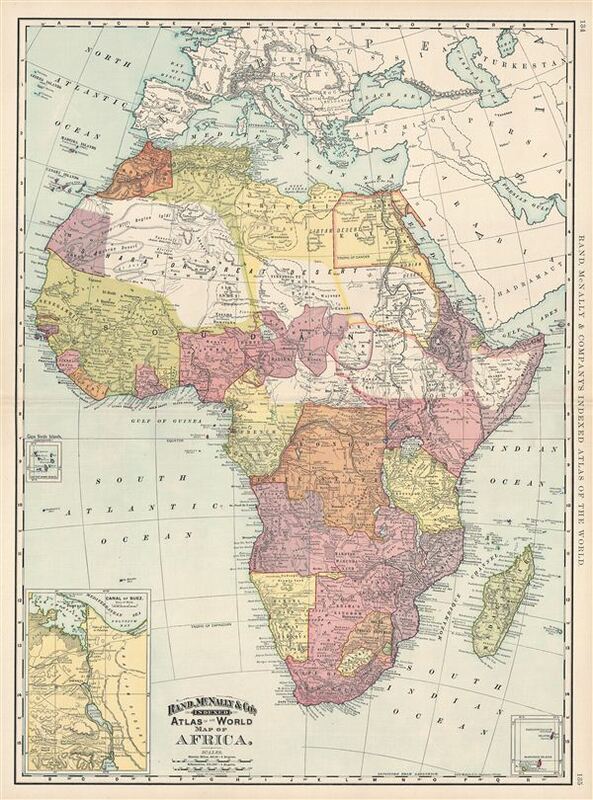 This is a beautiful example of Rand McNally and Company's 1892 map of Africa. It covers the entire continent from the Mediterranean Sea to the Cape of Good Hope, including the island of Madagascar. Parts of adjacent Arabia and europe are also included. Insets feature the Suez Canal, the Cape Verde Islands, the Cargados Carayos, and Mascarene Islands. Lake Victoria (Lake Nyanza), Lake Tanganyika and Lake Malawi (Lake Nyassa) are identified. During this period, most of Africa, except for Abyssinia and Liberia, was dominated by european colonial powers. In southern Africa, after the discovery of diamonds in 1867 and gold in 1884, colonial powers and the indigenous population struggled for control of resources. This led to the First Boer War in 1880 in which the British were defeated. The British were however victorious in the Second Boer War. After Berlin Conference of 1884 – 1885, the continent was formally divided in spheres of influence setting boundaries of colonial control. It was only after the end of the Second World War that these colonial territories would become fully independent. Color coded according to region, Rand McNally's map identifies numerous cities, tribes, and towns, as well as noting oases, rivers, deserts, mountains and various other topographical details, with relief shown by hachure. This map was issued as plate nos. 134 and 135 in the 1895 issue of Rand McNally and Company's Indexed Atlas of the World - possibly the finest atlas Rand McNally ever issued. Rumsey 3565.035 (1897 edition). Philip (atlases) 1026 (1898 edition).